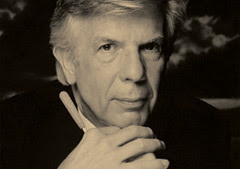 Christoph von Dohnányi conducts the New York Philharmonic. 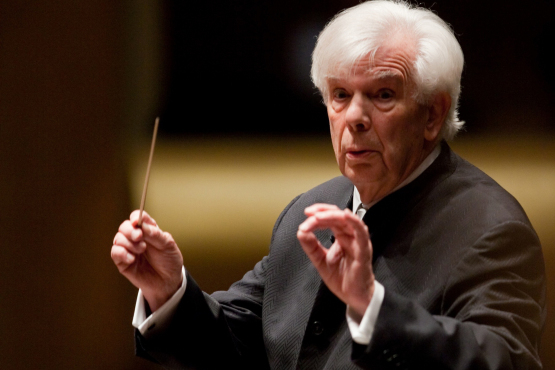 Christoph von Dohnányi has enjoyed a podium career spanning five decades, several recording contacts and a wide grasp of the standard repertory of the last three centuries. Yet, the most common criticism leveled against this German-born conductor is for his cerebral approach to music-making, a tendency to lead from the head, not the heart. So it was a surprise to see that his second week of programming at the New York Philharmonic featured Tchaikovsky's Pathétique symphony, the composer's final composition which premiered nine days before his untimely death. The work was featured alongside Dvořák's Violin Concerto and (k)Ein Sommernachtstraum, a complex curtain-raiser by Russian composer Alfred Schnittke. The Schnittke work is unusual in that its opening violin melody is played by the twelfth (and last) chair of the second violin section. This lone voice from extreme stage left was joined by flute, harpsichord and oboe in a pleasant theme that evoked the 18th century. Baroque pastiche quickly became parody, as Mr. Dohnányi brought in the full force of the orchestra. Much to the dismay of some listeners, that opening theme shifted into a particularly strident minor key, lurching like a drunken circus band to blasts of brass and percussion. The twisted, calliope-like melodies were kept under tight control by the conductor. Eventually, the brief work returned to its basic opening: flute, harpsichord, and that lone, twelfth violin. Mr. Zimmermann has long been a champion of this particular concerto, which he first played at the age of 14. He demonstrated his commitment with the initial thematic statement. This led to long, rich melodic lines and potent chords, which seemed to move in flight as the soloist slid his fingers up the neck of his instrument. The quick transition into the second movement allowed the soloist to shift into lyric mode, drawing out the rich melodies that make even the lesser works of Dvořák rewarding. The finale proved to be ingeniously constructed, built from the furiant and the dumka, two traditional Bohemian dances that happen to be in different meters. Mr. Dohnányi provided expert rhythmic accompaniment for Mr. Zimmermann. He sustained the listener's interest with gleeful technica wizardry, through the great length of the movement. The program of the Pathétique symphony was hinted at by Tchaikovsky before his death. There was nothing mysterious, however, about Mr. Dohnányi's forthright interpretation. The passionate main theme, beloved by listeners, gave way to a potent first movement with a hair-raising account of the stormy middle section. Mr. Dohnányi brought spare elegance to the second movement, a deceptive, courtly movement that seems like a waltz even though Tchaikovsky wrote it with five beats to the measure. The march was stirring and heroic, with powerful playing from the brass. They raged, stormed and finally locked step, bringing out the muscular, heroic qualities in Tchaikovsky's writing. Then it was time for the finale: a slow, halting theme that drifts in an ocean of despair. The cellos and woodwinds wept in the opening pages. This bleak landscape became even more harsh under Mr. Dohnányi. Instead of whipping the musicians into a pathological frenzy, his cool style served to cast light on the composer's ultimate resignation in no uncertain terms. The Metropolitan Opera slashes the cost of Wagner. 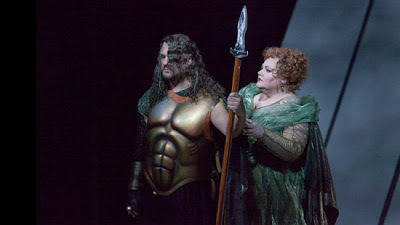 Downwardly mobile: Wotan (Bryn Terfel) and Fricka (Stephanie Blythe) in Das Rheingold. Photo by Ken Howard © 2010 The Metropolitan Opera. According to a report first posted on Norman Lebrecht's website Slipped Disc, the Metropolitan Opera has done the unthinkable, slashing prices across the board for upcoming performances of the three complete cycles of Wagner's Der Ring des Nibelungen. Checking ticket prices for an April 24 performance of Götterdämmerung (according to the Met website) are now as low as $45 for the rear of the Family Circle. Orchestra Balance seats (off to the side) are as low as $180 (formerly $275), with better seats (Orchestra Premium) going as high as $345 (down from $650.) There are even a few coveted aisle seats available for some shows.Das Rheingold has had ticket prices cut by as much as 50%, with Family Circle seats priced at the normal rate of $25-$35. A few days ago, they were $55. Even more surprising: the wide availability of tickets for the April 13 Die Walküre, opening night of that opera, which is considered the most popular entry in the tetralogy. This quiet, unannounced move may be a desperate attempt to fill the house as the Ring approaches. The cycles launch with the return of Das Rheingold on April 4. No information is available as to whether ticket holders who already bought seats under the old price structure will receive some sort of remuneration from the Met. The Metropolitan Opera's current production of the Ring, designed and directed by Robert Lepage, has met with mixed reviews as the four operas have launched over the last two years. The multi-million dollar production, constructed around a massive movable set (sarcastically dubbed "The Machine" by the stage crew) has had its share of performance malfunctions, occasionally forcing singers to improvise on the stage apron. More serious were two onstage accidents, both during 2011 performances of Die Walküre. The January premiere of Götterdämmerung featured some shaky special effects, including exploding plaster statues that were meant to evoke the fall of Wagner's Germanic gods but caused the opening night audience to laugh at the opera's climax. This month marks the first "full" performances of the cycle, which are traditionally sold to the Met audience as four-opera packages at double the face value of ordinary seats at the Met. The company's former production, by the German team of Otto Schenk and Gunther Schneider-Siemssen, was notable for being one of the company's most coveted tickets, and a perennial sellout. Met ticket prices have steadily gotten higher in the last three seasons, as the house has had to cover increased operational costs. These include general manager Peter Gelb's pricey Met Live in HD series, which brings Met operas to movie screens around the world on Saturday afternoons. Next season's brochure features a "staggered" ticket policy with higher rates being charged for new productions and of course, Wagner operas. In other news, the company has been generating much hoopla over a planned series of Live in HD re-runs of the video broadcasts of the four operas in the Ring. These screenings are not new films drawn from the April and May Ring cycles, but re-broadcasts of the performances shot in 2010, 2011, and 2012. The aron quartett at the Austrian Cultural Forum. 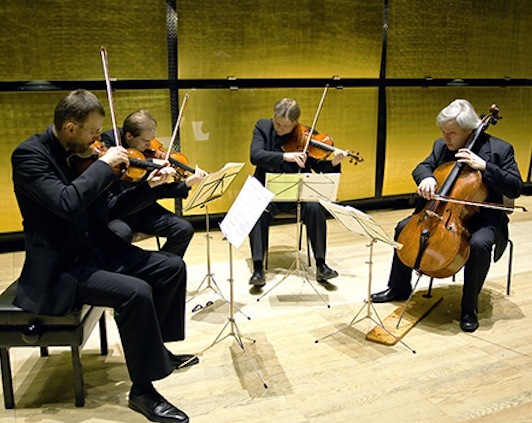 The aron quartett in concert: Ludwig Müller, Barna Kobori, Georg Hamann and Christophe Pantillon. On Wednesday night, the modern concert hall tucked into the second floor of the Austrian Cultural Foundation was host to the aron quartett, an enterprising ensemble of chamber musicians from Vienna. The occasion was a world premiere by Austrian composer Kurt Schwertsik. The packed house included the composer and his wife. The concert opened with the String Quartet No. 2 in d minor by Erich Zeisl, another in a long line of composers who fled the Nazis, emigrated America and found success in Hollywood. Mr. Zeisl is best remembered for his film scores including The Postman Always Rings Twice--although he later abandoned Hollywood to teach music and return to what he thought of as "serious" composition. Here, the aron quartett played his four movements with gritty earnest, with long melodic lines that unfolded from instrument to instrument. Plucked, scraped notes alternated with winding themes tossed from player to player in a performance that made a good case for more New York performances of this elegaic composer's catalogue. Kurt Schwertsik is virtually unknown in this country, and that is America's loss. His music proved to be witty, tonal and elegant, with a slightly arch, elevated tone rooted in his Viennese origins. The skizzen und entwürfe ("sketches and drawings" consisted of many short movements strung together, creating taut little sound-worlds that came to a cadence, rambled to a close, and occasionally stopped mid-thought. Despite the abrupt endings to some of these little pieces, none felt unfinished. The second half of the concert began with a short interview with Mr. Schwertsik, followed by the world premiere of the composer's Liedersammlung Op. 91, Nos. 3-6. These took the form of four short song-like pieces that paid homage to Mr. Schwertsik's compositional influences and musicians that earned his respect in the course of a long career. The short, elegant movements paid tribute to songwriter Burt Bacharach and jazz pianist Dave Brubeck. The most moving was the third lied an elegant tribute with heart-tugging melodic lines--a homage to Kurt Weill. The concert ended with the best known composer on the bill: Erich Wolfgang Korngold. Compared to his early operas, songs and film scores, the Korngold string quartets linger in relative obscurity. Written in 1945 as part of the composer's bid to escape Hollywood (where he had thrived and won two Oscars) this was part of Korngold's post-war bid to regain recognition as a serious composer in the years following World War II. This not the sweet melodist who conquered Europe with Die Tote Stadt and the hearts of Americans with his stirring score for The Adventures of Robin Hood. In the Third Quartet, Korngold is a much saddened, bitter man, though still firmly rooted in the Viennese tradition of Beethoven and Schubert. This whole work feels oddly covert, close in idiom to the middle quartets of Shostakovich, works that were safely locked away for many years to escape the eyes of Soviet censors. This may be bitter fruit, but this is still Korngold, and music that sparkles with wit and allusion. A melodic figure in the first movement cleverly lifts from Mozart's Don Giovanni. The Andante weeps, its sad minor key dripping with beauty and longing. The harsh alarums of the scherzo recall Shostakovich but also look back to Beethoven's Grosse Fugue. This long movement sets the stage for the kinetic Finale, a whirling Rondo that played out as a sophisticated four-handed game dealt by experts. Garrick Ohlsson, Louis Lortie, Maria João Pires to step in at Carnegie Hall. Maurizio Pollini lights up in London. Perhaps he heard about Mayor Bloomberg's smoking ban? 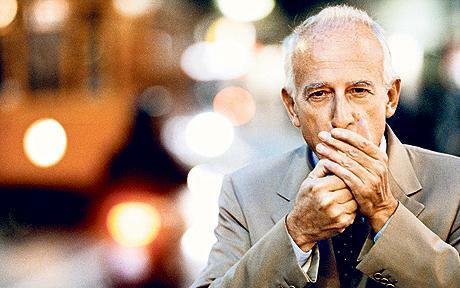 Breaking news from the Carnegie Hall press office: Italian virtuoso pianist Maurizio Pollini has been forced to cancel all of his planned spring appearances due to illness. This includes both recitals at Carnegie Hall, and a series of May concerts in New York and Philadelphia with the Philadelphia Orchestra. This is the second year in a row that Mr. Pollini has been forced to cancel his U.S. obligations. A similar announcement appeared in the New York Times in March of last year. A set of concerts with the Philadelphia Orchestra has also been nixed. Mr. Pollini will be replaced for the April 29 concert by American soloist Garrick Ohlsson, who has agreed to do an all-Liszt recital at the Sunday afternoon concert. This will be the second such program by Mr. Ohlsson in New York this year. A review of the artist's January recital at the 92nd St. Y is here on Superconductor. For the May 6 performance, Canadian pianist Louis Lortie will play two sonatas by Beethoven (the Waldstein and Les Adieux) and a selection of Chopin. At the May 18 concert at Carnegie Hall, Mr. Pollini's substitute will be the award-winning Portuguese pianist Maria João Pires. Ms. Pires will play the Second Chopin Piano Concerto, accompanied by Charles Dutoit and the Philadelphia Orchestra. This concert is part of an ongoing celebration of Mr. Dutoit's tenure with the Philadelphia Orchestra. He is stepping down at the end of this season to make way for incoming music director Yannick Nézet-Séguin. Concert Review: It's All Happening! American Mavericks comes to Carnegie Hall. 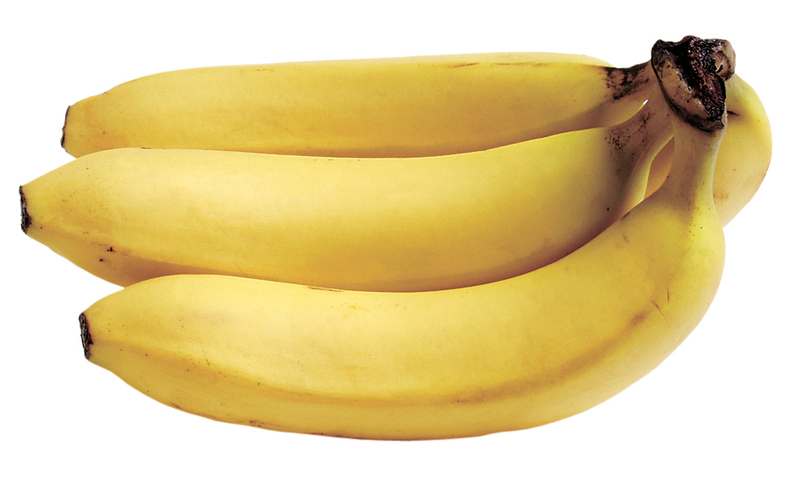 A key component of John Cage's Song Books, and a valuable source of potassium. The stage of Carnegie Hall on Tuesday night had a poker table on it. Some microphones, two pianos, and a counter with a typewriter at one end, some fruits and vegetables, and a blender. The Met's new production of Manon is all too familiar. "Chéri, which opera are we in?" Anna Netrebko vamps in Act III of Manon. The physicist Albert Einstein once defined insanity as "doing the same thing over and over again and expecting different results." That maxim might apply to Peter Gelb's administration of The Metropolitan Opera, which rolled out its new production of Massenet's Manon as a star vehicle for soprano Anna Netrebko. While the cast was (for the most part) strong, their efforts were undercut by a bland mise-en-scène by director Laurent Pelly, in his second show for the Met. Natalie Dessay slips into the little red dress. Lover boy: Matthew Polenzani returns as Alfredo Germont in the Met's revival La Traviata. Willy Decker's stripped-down La Traviata was the most controversial production at the Met last year. For its first revival, French soprano Natalie Dessay takes on the role of Violetta, a courtesan who finds love just as her time is running out. Matthew Polenzani returns as Alfredo, and Dmitri Hvorostovsky is Giorgio Germont. Fabio Luisi conducts. The feeling of dread is heightened by Mr. Decker's staging, originally presented at the Salzburg Festival. The opera is presented on a unit set with one exit: a steep, bare stage with curved white walls that might be in a hospital or asylum. The room is dominated by an enormous clock, and haunted by Dr. Grenville, a silent, death-like figure who is onstage for most of the opera. The party-goers of Paris (male and female) are in tuxedos, faceless figures in Violetta's empty life. 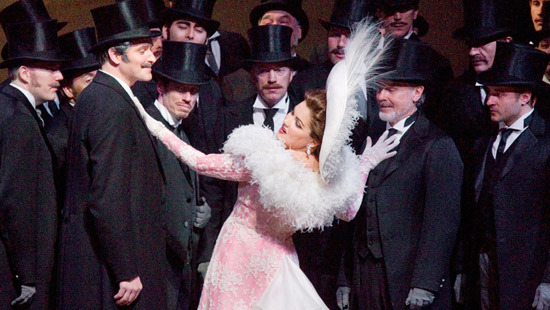 La Traviata is Verdi's most intimate tragedy. A setting of Alexandre Dumas fils La dame aux camilles, this is an opera about suffering, illness and time running out. Verdi was inspired to set the younger Dumas' play by his longtime relationship with Giuseppina Strepponi, a former opera singer. For this work, Verdi wrote some his most memorable music. Highlights include the brindisi in Act I, the soprano showpiece Sempre libera, and Di provenza il mar, Germont's appeal to his wayward son. Verdi's most heart-rending opera has been lucky on disc. So we're giving four recommendations. The glories of this 1963 recording are the young Renata Scotto (in prima voce as Violetta) and the rock-solid presence of baritone Ettore Bastianini as the elder Germont. I still recommend it, especially at bargain price. Carlos Kleiber was an extraordinary conducting talent who made very few recordings. This was one of his best, a studio-made, note-complete Traviata with a sensitive heroine in Ileana Cotrubas. The redoubtable team of Sherrill Milnes and Placído Domingo recorded a lot of operas together in the 1970s, but they manage to convince the listener as father and son. Expert Verdi conducting and a compelling performance by Roberto Alagna as Alfredo. Tiziana Fabbricini is a very good, involving Violetta who is helped by the live, theatrical recording made in Italy's most famous opera house. Reissued last year. I will also put a word in for this entertaining live recording from the Salzburg Festival. Anna Netrebko, captured in great form as Verdi's bird in a gilded cage. Rolando Villazon before he lost his voice. And like the Muti set, this has the immediacy of a live recording. Return to the Metropolitan Opera Season Preview! Piano man: Murray Perahia. Photo © 2010 courtesy Sony Classical. In the course of a long concert season, some recitals and concerts are akin to a religious ceremony. Such a one was Sunday's afternoon concert at Avery Fisher Hall, featuring Bronx-born pianist Murray Perahia. The lights of this great hall were down very low, creating an atmosphere of religious contemplation. A celestial beam lit the stage, as New York's own high priest of solo piano music strode to his instrument. As a hometown hero with impeccable taste and technique, Mr. Perahia is beloved by New York concert-goers. Yet he has earned their frustration as well, with a series of cancellations and health problems stemming from a 1995 operation to remove a bone spur from his right hand. This forced him to retire from performance for three years. Those physical problems, coupled with the artist's ongoing residency in Berlin have conspired to make a recital by this artist a special event. The repertory for this recital was conservative, with the three "B's" (J. S. Bach, Beethoven, Brahms) in the first half and Chopin and Schubert in the second. Mr. Perahia began with No. 5 of Bach's French Suites, his hands performing a complex terpsichore on the keys through the seven dance movements. The closing Loure and Gigue were lyric and uplifting, a strong argument for performing this music on the modern instrument. Beethoven wrote his piano sonatas for the wood-framed fortepiano of his day, destroying a few in the process. The 27th Sonata in E minor is one of his most unconventional. Consisting of just two movements, its tense opening and cheerful Rondo are testaments to the composer's volatile personality. Mr. Perahia's playing was conservative, focusing on the deep humanism of the writing and the composer's gift of phrase. The first half of the program ended with Brahms' late Klavierstücke--four piano miniatures from the composer's late period. Mr. Perahia announced Brahms' solemn presence through the cascade of heavy chords that open the first Intermezzo. From there he turned to warm, glowing melodies, leading a gorgeous waltz in the middle section of the second piece. Mr. Perahia's recent releases have included a disc of Brahms works, and his affinity for the composer's complex scheme and variations showed in the third Intermezzo, a kind of scherzo based on just four notes. Finally it was time for the vast, cinematic sweep of the Rhapsody in E Flat Major, which ends the set with a noble theme borrowed six years later by Brahms' friend Jean Sibelius for his tone poem Finlandia. The second half opened with Schubert's Sonata No. 19 in A, a work of sunny optimism with none of the obsession with death that plagued this young composer in his later years. Mr. Perahia made the sunlight of Schubert's Vienna shine into the dark cavern of Avery Fisher Hall, playing the three movements with lyric grace. The Andante flowed smoothly from his fingers, and the final movement had a fierce, determined joy. That ferocity and determination extended to the four Chopin works chosen by Mr. Perahia to end the concert. This ws not the simpering, soft Chopin of the salon, but music of a brusque, business-like determination. The C# minor Polonaise had a heroic swagger, its dance rhythms etched by the soloist in bold strokes. The murderously difficult Prelude No. 8 in F# minor followed. A tiny two-minute beast among the composer's 24, its nickname is "Desparation." Mr. Perahia kept a cool head and executed the tricky right-hand figures with his customary skill. The Mazurka No. 4 is just three minutes in length. Mr. Perahia showed that this brief work is packed with musical ideas and expressive possibilities. The little tetralogy ended with the muscular Scherzo No. 4, the last of the set. Mr. Perahia returned to Chopin's heroic mode here. The brash opening theme gave way to a slow, sad minor. The work ended with a mighty struggle to return to the major key. Mr. Perahia injected a note of triumph and achievement into the resonant final chords. LEGO man on the beach, presumably waiting for Einstein. Photo © SodaHead.com. 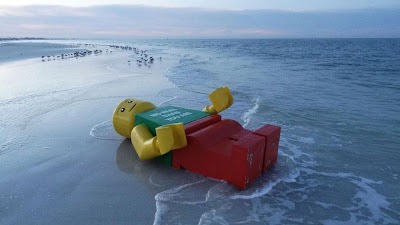 As a warm-up for next fall's BAM production of Philip Glass' Einstein on the Beach, check out this YouTube visualization of the opera's scenes and knee plays...rendered in LEGO®. Enjoy. Yefim Bronfman in recital at Carnegie Hall. 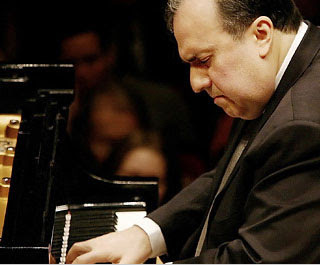 Determination: Yefim Bronfman in concert. When the pianist Yefim Bronfman made his entrance at Carnegie Hall on Friday night, it was the start of a heroic confrontation between the burly Russian-born artist and the black Steinway: his vehicle to play sonatas by Haydn, Brahms and Prokofiev. 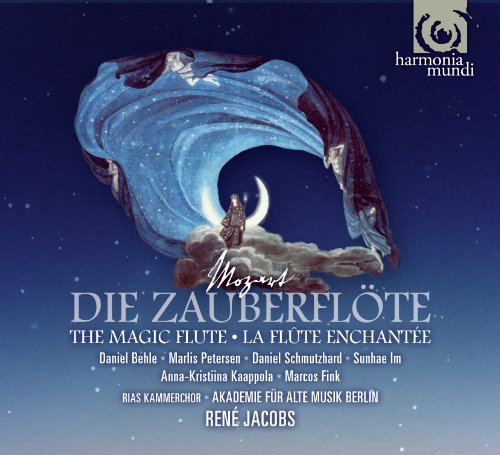 René Jacobs' 2010 studio Die Zauberflöte is three hours of Mozartean bliss. The new René Jacobs recording of Mozart's Die Zauberflöte stands apart from all the other recordings of this opera in the catalogue. Sprawling onto three discs and running almost three hours, this innovative set presents the opera as Mozart's original audience may have heard it in 1791. Most early recordings of Mozart's final opera either eliminated the spoken dialogue altogether (as "unmusical") or had the singers (or worse yet, voice actors) recite the dialogue with no accompaniment whatsoever. Too often, the result was a series of dry, boring interruptions in the music that would have listeners reaching for the 'skip' button. This recording takes the opposite approach, opening up all the standard cuts and treating the opera's libretto as organic dialogue between living, breathing theatrical characters. Jacobs has assembled a talented young cast, led by the pairing of Daniel Behle and Marlis Petersen as Tamino and Pamina. Daniel Schmutzhard is a warm, funny Papageno, able to cut loose in the opera's comic scenes. He is well matched with Sunhae Im as Papagena. (Ms. Im also does a convincing "old crone" voice for her character.) Marcos Fink is a sturdy baritonal Sarastro. Bass Konstantin Wolfff is all over the Temple in a triple role: he's the Speaker, one of the Priests and one of the Two Men in Armor. The only serious hitch in the casting is the Finnish soprano Anna-Kristiina Kaappolla as theQueen of the Night. Although this is a short part, recorded under studio conditions, Ms. Kaapolla caps her arias with some ugly attempts that hover near a high F but sometimes pull sharp. (This is especially noticeable at the very end of "O zittre nicht.") Were these the best takes that the recording engineers could manage? Character tenor Kurt Azesberger brings Monostatos to new depths of depravity, especially since he doesn't have most of his lines cut. His entry is accompanied by whip-cracks, making the slave-driving Moor a menacing figure. Also, the racist references in the libretto ("schwarz" and so on) are left in, along with the scene with the three slaves. All these effects sound like distractions, but they enhance the drama of the work, particularly in the complex second act with its rapid scene changes. The addition of a pianoforte continuo helps accent the spoken dialogue. 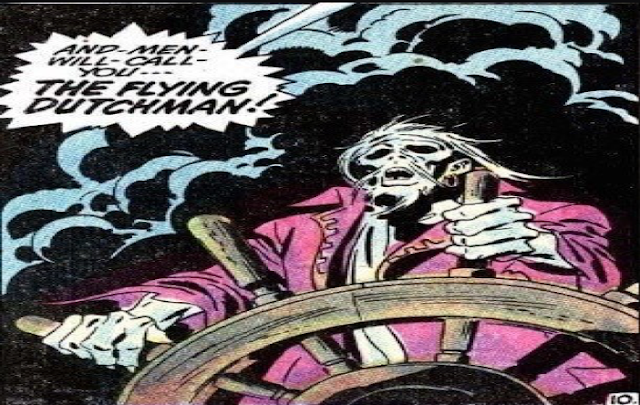 Also, this recording abounds in old-fashioned sound effects. Papageno is followed by the twitter of his captives, played on old-fashioned wooden bird-calls. The Queen of the Night gets a thunder-machine rattle every time she is even mentioned--and the big "bang"chord, mentioned by Schickenader in the libretto but left out of the sheet music. Some "period" recordings of Mozart sound dry and stuffy. But here, the instruments have bloom and bite, played and conducted with pin-point accuracy. Mr. Jacobs selects brisk tempos for the most part, but his decision to slow down for dramatic effect at times (most noticeable in the "dancing slaves" scene in Act I) works too. It's all about serving the drama and making this opera come to aural life as a living theatrical experience. Simply put: this is The Magic Flute as you've never heard it before. Christoph von Dohnányi at the New York Philharmonic. The ice man: Christoph von Dohnànyi, with baton in hand. Photo by Chris Lee © 2009 NewYork Phiharmonic. The music of Hans Werner Henze has never really caught on in America. Mr. Henze is one of Europe's most important living composer. His symphonies and operas are regularly played in concert halls and theaters on that continent. But his urbane, erudite music carries the whiff of modernity to it, and the fact that the composer is still alive (he's 85) doesn't help his case with skittish Philharmonic subscribers. Perhaps that was the reason for the sparse attendance and empty rows at Friday afternoon's New York Philharmonic concert, conducted by Christoph von Dohnányi. Those more timid audience members missed a lush harmonic treat, a set of Excerpts from Mr. Henze's 1966 opera The Bassarids. It was paired with an audience favorite, Schubert's "Great" Symphony, which may (or may not) be his last. The Bassarids (its German title is Die Bassariden) is a dark entry in the Henze operatic catalogue. These concerts mark the first U.S. performances of the Excerpts, four instrumental episodes that, like a miniature symphony, recap the important events of the opera. 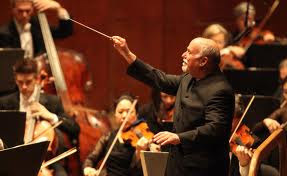 Mr. Henze writes for enormous orchestral resources, forcing the management of Avery Fisher Hall to deploy the stage extension to accomodate the full force of the Philharmonic. However, this 25-minute suite proved to be tonal, tasteful, and elegantly orchestrated, with passages that recall Richard Strauss' late mythological operas and the complex counterpoint of Bach. Based on The Bacchae by Euripides and with a libretto by W. H. Auden, opera tells of Pentheus, a Greek king who denies the divinity of Dionysius, the god of wine. For his trouble he is torn to pieces by the Maenads, the mad, drunken women who are sacred to that particular deity. This scene, depicted in the third section of the suite, was played with exceptional orchestral ferocity, with strong performances from the brass and the battery. Solo bassoons and cellos took the vocal lines of singers, requiring the principals on those instruments to play with exceptional lyricism and skill. The whole was conducted with expertise by Mr. von Dohnányi. The 81-year old conductor not only led the first 2004 performance of this suite, but the 1966 premiere of the opera itself. The second half of the concert featured Schubert's Great Symphony, which, given the uncertainty regarding that composer's catalogue, may or may not be his last major work for orchestra. Mr. Dohnányi led a engaging account of the score, supplanted by strong performances from the pared-down Philharmonic. Throughout the four movements, Mr. Dohnányi conducted with great respect for Schubert's song-like lyric line, from the boisterous theme that opens the symphony to the clarinet quotation of a key theme from Beethoven's Ninth in the finale. This was crisp orchestal playing of the highest caliber. Exhorted by the conductor (who was working without a score) the orchestra brought home Schubert's message of exuberant vitality, creating, in effect, a second ode to Joy. New York City Opera mounts Così fan tutte. A row to nowhere: the cast of the City Opera's Così fan tutte. L.-R.: Jennifer Holloway, Philip Cutlip, Sara Jakubiak, Allan Clayton. Photo by Carol Rosegg © 2012 New York City Opera. When George Steel assumed command of New York City Opera in 2010, he opened his tenure with a Christopher Alden production of Don Giovanni. Now, Mr. Steel and Mr. Alden have given us the second of three operas written by Wolfgang Amadeus Mozart and librettist Lorenzo da Ponte. Così fan tutte (The title loosely translates as "That's what all the girls do.") is a dramma giocoso, a dark comedy of infidelity and forbidden love. The spare production was mounted in a theater ideal for chamber opera, the 600-seat Gerald W. Lynch Theater at John Jay College of Criminal Justice. Rather than the usual clowning and drawing-room sets, Mr. Alden presented this opera as a stark, often disturbing exploration of men's attitudes towards women. Set in what appears to be an outdoor park (illuminated at times by ugly sodium lights), this staging is strange from the start, presenting the bet between Don Alfonso (Rod Gilfry) and the soldiers Gugliemo and Ferrando as a Faustian game that ultimately destroys all players. This staging of Don Alfonso's "school for lovers" slowly stripped the lovers of ethics, morals and dignity. They lose everything, including their clothes (and possibly, their sanity) as the revalations crash down in the final scene. The final image: all six characters flopped on a bench, self-medicating with one bottle of champagne, indicates that in this game, there are no winners. In this production, Don Alonso is a Mephistophelean figure, suave and seductive as he leads the two pairs of lovers on a path toward ruined relationships. Mr. Gilfry, whose long experience in Mozart includes recordings of all three "Da Ponte operas (with John Eliot Gardiner) made his City Opera debut with these shows. His preence here is something of a coup for the troubled company. Marie Lenormand took on the challenging, ungrateful part of Despina, bringing new dimensions to the sister's maid, the opera's trickster role. Ms. Lenormand executed some impressive vocal filigree and some stunning costume changes, including the beginning of Act II where she tricked out in a suit and bowler hat. Wielding a riding crop, she made Mr. Gilfry prance in a bear costume--on loan from a production of The Bartered Bride? Sara Jakubiak took on the difficult role of Fiordiligi with a strong, penetrating soprano that was agile enough to handle the treacherous leaps written into the part. She was at her most moving in the work's opera seria passages, particularly "Per pietà, ben mio, perdona," . In this Act II aria, Ms. Jakubiak capturing the pathos of a woman torn between her fiancée and her new "Albanian" boyfriend. Jennifer Holloway provided contrast as Dorabella. She accented the intellectual side of the character in the first act. Dorabella is the first of the two sisters to admit to falling in love with her new beau Ms. Holloway made the most of her Act II duet with Gugliemo, letting her pliant instrument dive gracefully into the long, seductive vocal lines. 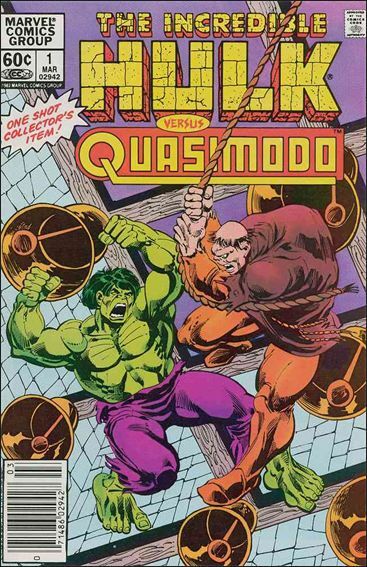 Allan Clayton (Ferrando) and Philip Cutlip (Gugliemo) did their best not to make their characters interchangeable, despite the fact that pulling that very switch lies at the heart of this opera's plot. Mr. Clayton was a potent presence in his Act II "betrayal" scene. Mr. Cutlip was warm, seductive and very funny in the early acts, but went foetal in the final scene as the truth came out. Mr. Alden's vision was helped by the compelling conducting of Christian Curnyn. Leading a scaled-down orchestra that was tightly packed in to the theater's pit, Mr. Curnyn favored swift, driving tempos that never gave the music room to breathe. The singers kept up. The orchestra showed itself to be in good form on Thursday night, although certain notes in the brass left something to be desired. The modern music festival comes to Carnegie Hall. 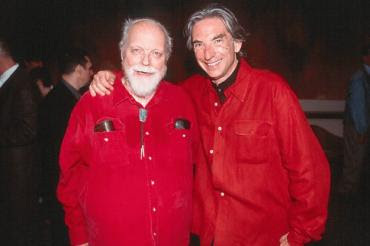 Redshirts: Michael Tilson Thomas (left) with composer Lou Harrison. Photo © San Francisco Symphony Orchestra. John Cage. Charles Ives. John Adams. Steve Reich. Meredith Monk. These are just a few of the composers featured at American Mavericks, next week's week-long festival at Carnegie Hall celebrating the bold music of American composers who continue to push the envelope in the 20th century and beyond. The program seeks to challenge the traditional conservatism of Carnegie audiences by presenting these modern composers next to each other instead of trying to contrast them with better known music by Brahms or Tchaikovsky. The week-long concert series is curated by Michael Tilson Thomas, music director of the San Francisco Symphony Orchestra. "M.T.T. ", (as he is known) has assembled an exciting series that should make the staid plaster arches of the Stern Auditorium echo with exciting new sounds. The sound moves upstairs on Tuesday, with the first of two concerts by the San Francisco Symphony Orchestra. Jessye Norman joins the orchestra to sing works from the Cage Song Books. But the real plum here is the New York premiere of John Adams' Absolute Jest, a kind of concerto for string quartet and orchestra. Wednesday night features special guest Emanuel Ax, playing Morton Feldman's Piano and Orchestra. Also featured: Sun-Treader by the underrated composer Carl Ruggles, and A Concord Symphony by American pioneer Charles Ives. The festival ends with two concerts at Zankel Hall, featuring members of the SFSO. Thursday night features the fantastical music of Harry Partch, whose kit-bashing approach to composition resulted in the creation of some truly unique instruments. The concert also features music by David Del Tredici, the New York premier of Mason Bates' Mass Transmission, and the Concerto for Organ with Percssion Orchestra by Lou Harrison. Friday night features Music for Pieces of Wood by Steve Reich and the New York premiere of Ms. Monk's Realm Variations. The concert (and the festival) ends with Echoi by Lukas Foss and Jacob's Room a monodrama by Morton Subotnick. What a missing CD cover taught me about Bach. The missing Rosalyn Tureck album cover. I still don't have it! Today is the 327th birthday of Johann Sebastian Bach. 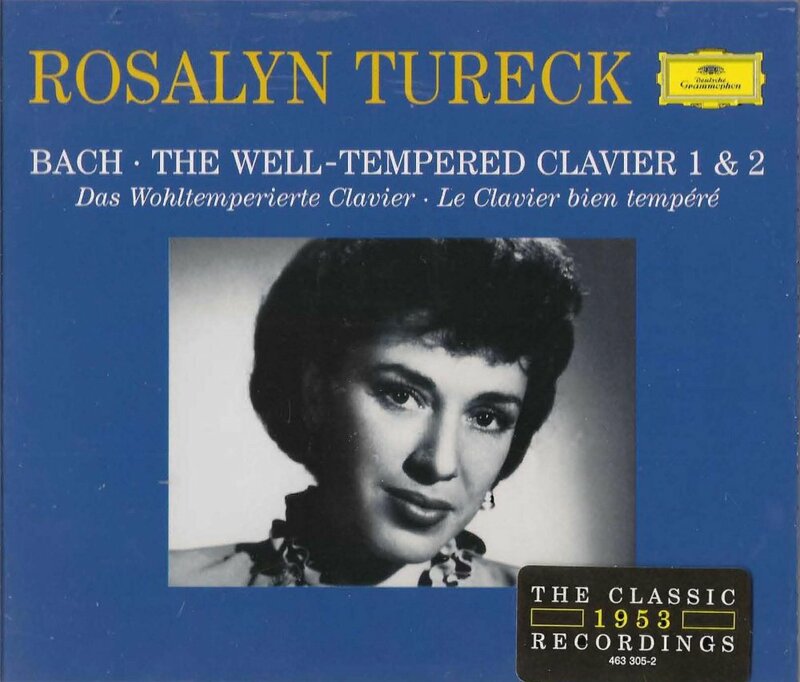 To celebrate, it's time to take a look at some of the recordings of Rosalyn Tureck. Born in Chicago in 1914, Dr. Tureck was a pianist who devoted extraordinary keyboard gifts to the interpretation of Bach. Her recordings of the Goldberg Variations, Keyboard Partitas and the two books of The Well-Tempered Clavier are touchstones, revered by collectors and by pianists like Glenn Gould. She died in New York at the age of 88. I first encountered Ms. Tureck's playing in 1999, when Deutsche Grammophon sent me the 4-disc set of her recordings of the complete Well-Tempered Clavier. I well remember putting the first disc into the drive of my office tower computer, putting on the big noise-blocking headphones...and hating it. The familiar C Major Prelude of Book I was taken at a maddening, slow pace, the notes seeming to sleep-walk out of the speakers in hissy mono sound. The whole piece was a minute slower than other recordings, like Chinese water torture. I kept listening. Some of the later Preludes and Fugues were still slow to me. My inner Bach metronome was used to the "Gould" approach to tempo. I didn't really appreciate the beauty of her approach to this music. After writing a mumbling, middling review for the website I was working for, I put the recordings aside, going back to Glenn Gould and Andràs Schiff, another pianist who remains a favorite today. Later, I wanted to get rid of that set, to send it out into the world of used CDs where music journalists often trade in their acquisitions for a bit of ready cash. But I didn't, mostly because the producer at that website had lost the front-cover label insert, making the set worthless to a dealer. Reluctantly, I kept it. The set sat on my shelf for years, wedged between the big Sony Glenn Gould "Original Jackets" box and Mr. Schiff's orange box of Bach for Decca. It stayed silent in its case for over a decade. When I did "Project Upload" (moving many recordings of mine into hard drives and iPods) it was left out. With the Bach birthday this week, I took out that Tureck boxed set, as well as recordings of the Partitas and Goldberg Variations that I'd acquired as part of the Great Pianists of the 20th Century series. I uploaded all eight discs of Ms. Tureck's recordings that I had. I transferred them into my iPhone. Now, her approach to these short pieces not only felt right, but were extraordinary in their beauty. The piano works seemed thoughtful, beautifully paced and carefully measured. Ms. Tureck's playing hadn't changed. The Ebène Quartet plays Zankel Hall. Raphäel Merlin, Mathieu Herzog. Photo © 2011 21C Management. 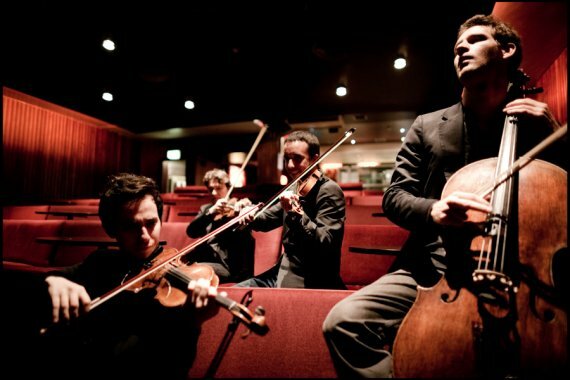 In the staid world of chamber music, the Ebène Quartet are fast-rising stars. These four energetic young French musicians proved that status on Sunday evening with a concert at Zankel Hall, the final stop on their North American tour. The concert was evenly split between standard repertory of Mozart and Beethoven, and a second set that ranged from modal jazz to modern songwriting. This Quartet: violinists Pierre Colombet and Gabriel Le Magadure, violist Mathieu Herzog and cellist Raphäel Merlin, has been making waves lately with acclaimed performances of accepted chamber repertory to their fearless assaults on beloved jazz tunes. They have been playing for twelve years, and the tight interaction of these four young musicians makes their concerts fascinating to watch, as the sounds and energy travel telepathically between the players. The concert opened with the group's sweet, lyrical side with the D minor quartet written by Mozart and dedicated to Haydn. This allowed the players to sally forth in the galant style, producing rich, warm tone from their vintage instruments. Violins, viola and cello engaged in a sophisticated conversation, inviting the audience to witness the debate as they moved lightly through the four movements. Beethoven's Quartet No. 14 (Op. 131) is one of the composer's most unconventional late creations. With seven short movements and a climactic central theme and variations, the "1-3-1" broke every compositional rule and laid the groundwork for the composer's last three musical statements. With a slow, sad fugue at the beginning and a bold sonata form at its end, it reversed the normal order of movements and added lilting baroque dances that looked back to Bach. The Ebène players brought passion and energy to this unconventional structure, unfolding the work like a complex murder mystery with the composer as the perpetrator.. They met the challenges of phrasing and expression with a head-on attack. The wildest and most chaotic moment: the "snap pizzicato" that predicted the percussive writing of Bartók kept its power to surprise unprepared members of the audience. This was a passionate performance: expressive and deeply involved in the music. The fugue had an appropriate air of mystery. The dance and scherzo were filled with sad nostalgia. This was not the cosmic exploration that some ensembles bring to this music, but a deep, psychologically complex interpretation that culminated in the aggression of the final movement. They worked through the complex development and recapitulation to the coda, a final re-statement of the strange fugue that opens the piece. The second half of the evening was devoted to a mix of jazz standards, popular songs and the occasional work by a contemporary composer. It opened with a lucid rendition of Wayne Shorter's jazz classic "Footprints", originally written for Miles Davis. Two violins and the viola took the horn and piano lines against Raphäel Merlin's steady, plucked bass. 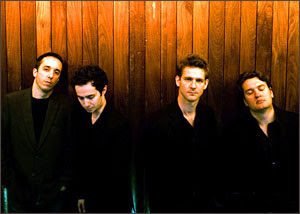 The set also featured "Unrequited," a song by contemporary composer/pianist Brad Mehldau that breathed with longing, and a bold, raucous take on the much-covered "Come Together" from The Beatles' Abbey Road. This featured diverse instrumental techniques, from bowed verses to plucked phrases, with a grinding groove of the song's famous riff. The Quartet used the same arrangement for "So What" and "All Blues", selections re-arranged from the Miles Davis classic Kind of Blues. Here, the lines of Miles, John Coltrane and Bill Evans were flawlessly rendered, with the odd harmonic foray and re-orchestration representing the alto sax of Cannonball Adderly. The Quartet responded to the enthusiastic audience with one encore: an unconventional (and veyr French) take on "Someday my Prince Will Come," written by Frank Churchill for Disney's first feature, Snow White and the Seven Dwarfs. The four members sang the opening and closing verses a capella, returning to their instruments for the central section. The sung final bars ended this concert on a joyous, upbeat note. Read the Superconductor interview with the Ebène String Quartet. The American Symphony Orchestra present Franz Schmidt's Notre Dame. Steve Mitchell.© 1983 Marvel Comics Group. Schmidt (1874-1939) was an Austrian composer, the author of four powerful symphonies that are favorites with brass players. He faded into obscurity after World War II, although he has his champions: including Dr. Botstein and Austrian conductor Franz Welser-Möst. A post-Wagnerian (who played cello in the Vienna Philharmonic under the direction of Gustav Mahler) Schmidt's musical idiom falls between the brassy religiosity of Bruckner and the Viennese wit of Richard Strauss. The music uses leitmotifs, a series of short themes depicting Hugo's colorful characters. Traces of tambourine and minor-key Hungarian violins depict Esmerelda. Powerful brass themes reference the bell-ringer and his master, the Archdeacon. 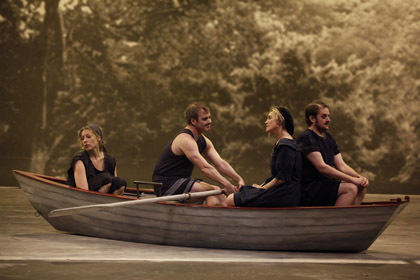 The two acts feature three scenes each, separated by long symphonic intermezzos to cover the complex stagecraft needed for a full performance of this opera. An organ lends weight to the scene in front of the cathedral. The great bells of Notre Dame are depicted by crashing gongs at the opera's close. Leon Botstein managed the big forces of this opera with skill, drawing some beautiful lyric lines in the Intermezzo, the only part of this work performed with any regularity. There were some dynamic problems in the second act, with the soloists being drowned out by the waves of sound, but the last bars crashed home with stunning power. The opera moves the focus of Hugo's story away from Quasimodo, the hunchback, and onto Esmerelda, the innocent Gypsy girl. Here, she was played by soprano Lori Gulbeau, who has a pleasing soprano with spinto power and some flexibility. Ms. Gulbeau projected Esmerelda's deadly cocktail of sexuality and innocence, creating a moving portrayal of this compassionate character. Like a less ruthless version of Carmen, she is a force of nature, causing the downfall of all four male leads by simply existing. The most significant of these four would-be paramours is the Arch-Deacon of Notre Dame. (Claude Frollo in the novel.) He is the very picture of religious rectitude and sexual frustration. Stephen Powell walked a fine line between piety and desparation, using his potent baritone in the prison scene to convincingly portray the deacon's capricious, ambivalent attitude toward Esmerelda. He repents at the last moment, crying for her to live as she is executed, but falls off the cathedral. The most difficult casting requirement is a pair of heroic tenors. They're required to play Grigoire (Esmerelda's unloved Gypsy husband) and Phoebus, the young knight she falls for. requires two heldentenors for the roles of Phoebus and Gringoire. Robert Chafin moved between heroic voice and characterful, whispered singing as Grigoire. Corey Bix displayed impressive, ringing tone as Phoebus, with the right hint of metal in his voice. Turkish bass Burak Bilgili sang Quasimodo with a harsh, guttural delivery, growling out the bell-ringer's part with power and authority. One sensed the hunchback's despair following the execution of Esmerelda and his subsequent murder of the Archdeacon. In this final scene, Schmidt's opera rose to the tragic heights of Victor Hugo's novel. The Ebène String Quartet plays Beethoven, Bartók and...the Beatles. One does not always associate chamber musicians with jazz, electronica or surf music. For the Ebène String Quartet, this music is not only influential, but enjoys a place next to Beethoven in their concert repertoire. I met with three members of the Ebène Quartet on Friday morning: violinists Pierre Colombet and Gabriel Le Magadure and cellist Raphäel Merlin. They conduct interviews like they play, picking up threads of conversation and tossing ideas back and forth around the round table in Landmarc, a bistro on the third floor of the Time Warner Center in Columbus Circle. David Zinman winds up The Modern Beethoven. David Zinman demonstrates baton technique. Photo by Chris Lee. © 2012 The New York Philharmonic. This is the last week of The Modern Beethoven, the New York Philharmonic's spring festival pairing six of the composer's symphonies with unfamiliar concertos from the 20th century. This festival is the brain-child of David Zinman, the Bronx-born conductor whose uncompromising approach to music-making strips years of aural varnish from Beethoven's familiar scores. The concert opened with a boisterous, no-frills reading of Beethoven's First Symphony. Mr. Zinman created a fresh musical statement from this early example of the composer's style, choosing energetic, but not hurried tempos. The orchestra responded, playing with great clarity and refinement. The "modern" work on the program was the most interesting yet: the first Philharmonic performances of Karl Amadeus Hartmann's 1939 Concerto funèbre for violin and orchestra with soloist Gil Shaham. Despite a few Webern-esque squawks in the opening bars, this 20-minute concerto, played in one continuous movement, proved appealing, and yes, tonal. A German composer who was profoundly unsympathetic to the Nazis, Hartmann wrote this piece as the storm clouds of World War Two gathered. Musically, this concerto forms a bridge between the diaphanous fabrics of Wagner's Parsifal (which it quotes, repeatedly) and the war symphonies of Shostakovich. Hartmann also incorporates Czech and Russian folk songs, expressing sympathy those countries, soon to be attacked by the Nazi war machine. Mr. Shaham played with a keening, dry tone from the opening, a chorale based on a Hussite hymn from what is now the Czech Republic. The soloist was all business, making his instrument sob with grief in the slow section of the work, scratching out minor chords of rage like a speed-metal riffer in the Allegro. The finale featured a second chorale, evoking the fate of Russia as it stood in the path of the Nazi war machine. It came to a quiet close, then regenerated for a powerful coda, ending with loud, brash chords. The concert ended with a Beethoven heavyweight: the 50-minute Eroica Symphony. Mr. Zinman's approach to this familiar score is to bring out details in the music that may have gone unheard before. The first movement had great detail, especially a theme in the low strings that later becomes the basis of the finale. The funeral march was philosophical, but not dragging in tone. The infusion of energy common to this conductor's podium style occurred in the third movement, a boisterous scherzo that allowed the Philharmonic's woodwinds and brass their turn in the spotlight.Although the horns, led by principal Philip Myers did not sound their best here, the playing had a rude energy that made up for dodgy intonation. Best of all was the finale, that famous theme and variations where the composer treats the sections and sub-sections of the ensemble as players in an oversized piece of chamber music. As the theme was tossed between the player, Mr. Zinman occasionally beckoned for more volume, or made an hermetic slashing pattern with his baton. The result: an invigorating performance of this famous symphony, and a fitting close to three weeks of The Modern Beethoven. The Metropolitan Opera revives Macbeth. Thomas Hampson and Nadja Michael discuss dinner plans for King Duncan. The Metropolitan Opera's recent hot streak continued Thursday night with the return of Verdi's Macbeth. This revival of Adrian Noble's stark 2007 show featured two debuts, making for an evening of bloody good Shakespeare. As Macbeth, American baritone Thomas Hampson remains an uncommon singer, taking on a role that is on the heavy side for his smooth, pliant instrument. He pushed the limits of his voice at times, using all of his skill as an interpreter to find the dark, murderous heart of the character. His voice fades slightly at the lowest notes--audible in the Act III scene with the Witches. However, he handled the wide dynamic range, going from horrified whispers to shouts of bravado. The quality of singing in the final act made one long for Verdi's (original) 1847 ending, where the King gets a proper monologue and death scene at the opera's end. Opposite him was German soprano Nadja Michael in her house debut as Lady Macbeth. Mr. Hampson and Ms. Michael have played the Macbeths before, notably at Covent Garden. They play Shakespeare's ambitious Laird and Lady as an old married couple, whose blood-drenched quest for the Scottish throne presents a welcome alternative to haggling over haggis. Lady Macbeth is not a long part. Her vocal demands are even greater than those placed on the hapless husband, with whispered passages, muttered oaths, a soaring brindisi and moments of sheer, lung-busting power. Ms. Michael brought her 'A' game, starting with the Letter Scene. She brought steely determination to the central acts, egging on Mr. Hampson, singing with power where a lesser soprano would have screamed. But that was all appetizer for the main course: the Sleep-walk in Act IV. Here was a performance where Verdi's music expertly underpinned the translated Shakespearean text. Ms. Michael opened the door into the unworldly mind of the mad Lady M., hissing out "Va il tico maladetto" and floating the last notes of the scene with impressive technique. 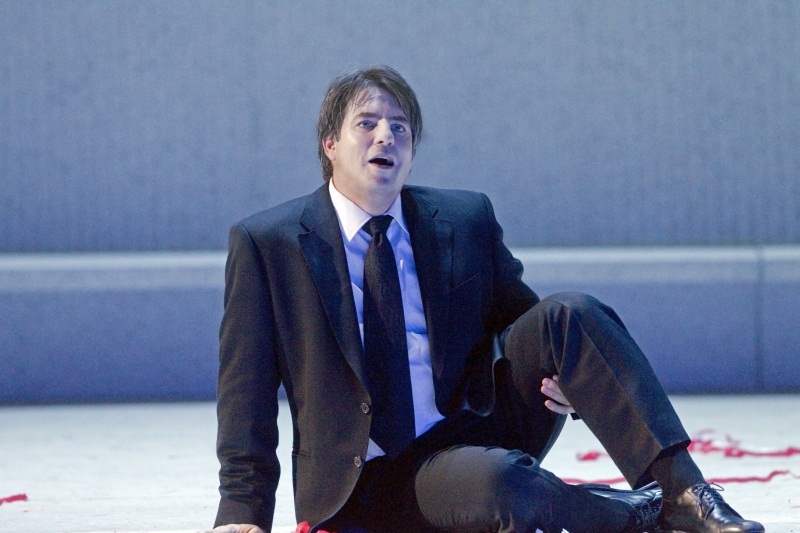 Tenor Dimitri Pittas made one wish that Macduff was a bigger part with his Act IV aria mourning his murdered children. But his voice vanished after that scena into some ugly sounds. Günther Groissböck was a bluff Banquo who was more dramatically interesting as a ghost. The choristers were solid as the Witches, the Murderers (though the "Murderers Chorus" is Verdian overkill.) They also delivered a tight "Patria oppressa", an effective 19th century protest song. Conductor Gianandrea Noseda showed his skill and experience, leading the revised 1861 version of the score minus the ballet. He chose fast tempos that had the orchestra moving briskly through Verdi's dark Scottish landscape. Mr. Noseda conjured the dark forces of the Witches scenes effectively, and brought off the complicated finale with panache. Mark Thompson's set: soaring black columns, a fieldstone disk stage and background of trees scream of New Bayreuth. Goofy modern touches remain: Scottish warriors armed with AK-47s, IKEA furniture, and drop-down light fixtures. The Witches are a gaggle of society ladies, with lit flashlights in their clutch purses. Are they supposed to represent the donors who funded this show? "Homer Simpson: you will renew your Metropolitan Opera subscription!" 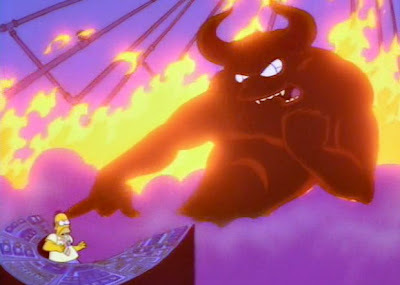 Image from The Simpsons: Treehouse of Horror IV, © 1991 Gracie Films/20th Century Fox. The Metropolitan Opera's 2012-13 season brochures are out. In the past year, it appears that the company has been hard at work figuring out how to squeeze as much money out of the pockets of New York opera-lovers. To that end, they've implemented two major changes to the way you buy your tickets. In the old days at the Met, a subscriber had their seats in one of the opera house's six levels of seating: Orchestra, Parterre Box, Grand Tier, Dress Circle, Balcony, Family Circle. Each level had different prices for side (partial view) seats and for "main," with the box seats on one level corresponding in cost to the "main" seats on the level above. Starting in 2011, the Orchestra was divided into "Premium," "Prime" and "Balance." That should have been a warning for what was to come. Premium: The first six rows in the center blocks of seats. Prime: The remaining center seats. Balance: The back left and right corner seats, which do not afford the best view. My 2011-2012 subscription seats in the Family Circle (Row B, 107-108, Row D, 106-107) are now "Family Circle Premium" and as a result I am faced with a choice: move back to cheaper seats or pay $10 more per ticket ") Since I have two subscriptions (part of my ongoing effort to keep writing about an opera company that doesn't want bloggers writing reviews of its shows) I'm looking at a renewal fee of approximately $850 for next season. The Met has learned well from Ticketmaster, Live Nation, the New York Mets (who put this system in in the 1990s) and other legitimate ticket agencies: gouge your customers whenever possible. Each purchase made from the Met (even at the box office) has a "facilities" fee of $2.50. Ordering by phone or the Internet? Add on another $7.50 (again per ticket) "convenience charge." That adds up to a hefty $10 fee per seat per night. The Met continues its third year of charging fees to change your tickets. This year, the fees go up to $7.50 per ticket. So if you buy seats for the opera, it may be cheaper to keep them. If your grandmother dies or something, you can still donate them back as a tax-deductible contribution to the opera house. Doing some digging through the site reveals that certain productions are not available for exchange. This year, the Met introduces a new "Price Categories" system, inspired by the price-gouging that goes on at Broadway houses. If you look at the individual ticket orders on the back pages of the program, you'll find little red letter grades next to the operas that are scheduled. Those letter grades (A, B, C, D, E, F, with F for "holiday" performances) have correspondingly higher ticket prices. The higher the "letter grade" of the night you want to attend, the more you'll pay. The Met was already charging attendees more for performances on Friday and Saturday, but this is the next coldly logical step. So if your seats are in the Family Circle on an "E" night, you could pay as much as $15 more per ticket, in addition to all the fees mentioned above. If your seats are lower down in the house, the amount added gets higher, with an "E" ticket in the Orchestra Premium going up by a staggering $40.00. Looking closely, it's apparent that the letter grade system (reminiscent of New York City's new health inspection grades) are not organized according to what opera is being performed. They're attached to the specific operatic performances (days of the week) that the Met believes will be the most popular of the season. The next step is to start charging more for performances where stars are scheduled to appear. If that happens, and Anna Netrebko doesn't show up, don't expect the Met to give you a partial refund. Want to know what you'll be paying for? Our first look at the 2012-2013 season is here on Superconductor. Photo by Ben McDaniel, taken at the Wirtsburg Gasthaus in Freiburg, Germany. 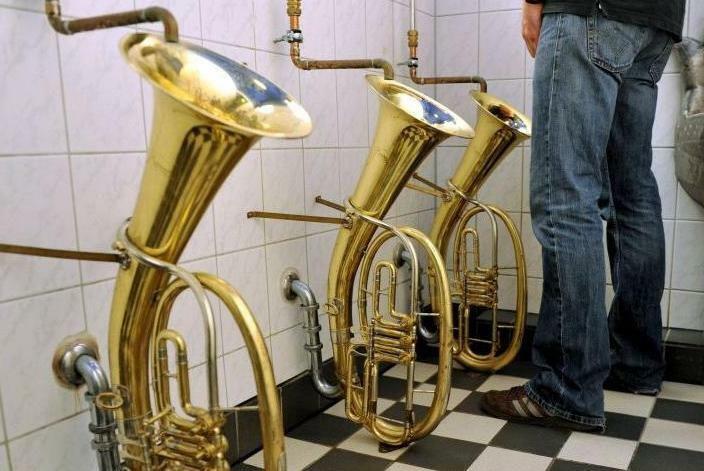 No, these aren't the "new water closet arrangements" at the Bayreuth Festival. 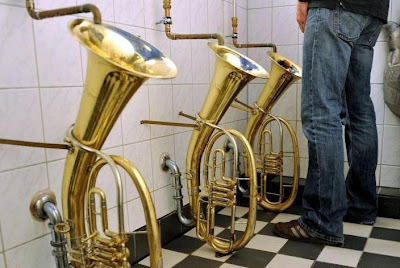 But it does appear to be three urinals built from former Wagner tubas, the French horn/Saxhorn hybrids designed by Richard Wagner for performances of his Ring cycle. They're also used for performances of the last three Bruckner symphonies: the Seventh, Eighth, and Ninth. A Serious Work of Socialist Realism. Music by Dmitri Shostakovich. Enjoy. The great composer as drug of choice. Trust him. He's got what you need: Wolfgang Amadeus Mozart. OK. I admit it. I'm a Mozart addict. I have (at last count) multiple complete recordings of Le Nozze di Figaro, (seven) Don Giovanni (six) and Die Zauberflöte (seven). Those three operas never diminish for me upon repeated listenings. Many more have passed through my shelves in the 20 years I've been collecting CDs. I have several Entführung aus dem Serails (three), Così fan tuttes (five) and Clemenza di Titos (two). I even own four: (counted 'em) four recordings of Idomoneo. Though it's not my favorite Mozart opera it's still one of the best examples of serious 18th century opera, and should be performed more. I have piano concertos, symphonies and piano sonatas. Serenades, divertissements, and A Musical Joke. I even own two recordings of his vulgar little Canon in B Flat Major: "Leck mich im arsch." My first live Mozart opera was probably The Magic Flute although I seem to remember a City Opera attempt at the fragment L'Oca del Cairo. My first date with a girl in high school: I took her to four hours of Le nozze di Figaro. And I've been to Salzburg and Vienna, weeping at a performance in the Hohensalzburg of that old party favorite Eine Kleine Nachtmusik. I know the details of his life. The real ones, not the dramatized falsehoods in Amadeus. I know that he was a genius, and no saint. His unusual gifts led to an unusual childhood, and 37 bright-burning years immersed in the creation of music that has lived in the consciousness of Western thoughts for over two centuries. I'm hooked on Mozart....and I'm proud of it. With the exception of the month of August and the occasional opera review, I don't get to write much about Mozart on this blog. But his music, with its rich humanity, endless inventiveness and capacity to surprise the ear even when you've heard it an uncountable number of times never ceases to amaze. Even a turgid performance of one of the symphonies (like the one the other week) offers opportunities to analyze and marvel the perfect, crystalline structures of notes: houses of cards that glow in rich colors and never collapse. Yep. I'm addicted. Thank God. Five minutes of Verdi, for my friend's birthday. A young hopeful sings her first Aida at the Muppet Theater. Image © 1980 Jim Henson Productions/CBS. For your musical edification (and for the entertainment of a dear friend who is having her birthday today) we are proud to present The Muppetropolitan Opera's production of Pigoletto, a pastiche of Verdi, Wagner, and Bizet that's even more fun than The Enchanted Island. Pigoletto stars Beverly Sills as Violetta. Her grace and good humor do credit to those of us who aspire to a higher art than spoon hanging. 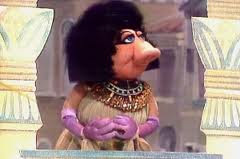 Footage from The Muppet Show: "Beverly Sills." © 1980 Jim Henson Productions/CBS. La Forza del Destino from Vienna. Giuseppe Verdi's La Forza del Destino remains the most challenging of the composer's operas to produce successfully. With a huge story that sprawls across two countries and many different locations, this attempt to completely destroy the dramatic concept of Aristotelian unity can be a director's nightmare. On this DVD from the Vienna State Opera, (filmed on March 1, 2008) British director David Pountey offers some innovative solutions, drawing inspiration from the spare writing of Cormac McCarthy. and the opera's wartime setting. The production, designed by Richard Hudson, places most of the action on a unit set, a white rotating plinth with a door at one end. This unit does heavy duty as bed-chamber, tavern, monastery and battlefield as needed. In the last scene, it rotates one last time to become the area before Leonora's cave, with a door at one end the gateway to sanctuary and redemption. A high scaffolding surrounds the action, providing different acting surfaces for the tavern scene and the battlefields of Act III. Blood-red swords (indications of the coming fight between Don Alvaro and Don Carlo) are a recurring motif), doubling as crosses. Bodies hang from the scaffold as a grisly chandelier. Images of war and blood are projected on the action, which might have looked better in the theater than on video. The costumes move between Westerns and 20th century military dress, with the old fascist colors of red, white and black predominating.